In those days, before the high tech computers of today, offices were staffed to the hilt and looking busy was a good thing. Take an interest in how your company runs. Become knowledgeable about the areas that are having problems and do a study on how these problems can be rectified. Take them to the powers that be and show in a well thought out manner the alternatives you have come up with. Note: there should be more than one. Ask questions about problems that are open ended. Start with words like what, where, when, how and why. Be motivated by the answers you get. Volunteer to head or be a part of a committee to get new ideas to solve. This may require some of your off hours. If committees are not your thing, do a case study on your own. These are just a few things you can do. 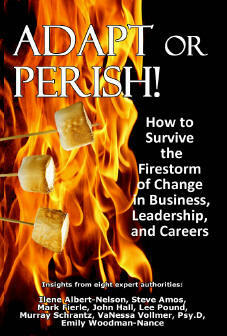 For more read our book Adapt or Perish. It’s coming out next Spring and will give you many insights from the authors that have done these things to make a difference in their companies. In today’s world it’s a whole lot more meaningful than the “looking busy” of the 50’s.